In my post Retreating is not necessarily “retreating” I discuss the pleasure of attending a quilting/crafting retreat with other crafters – whether they are old friends or new friends. Well later this week I head to a 4-day quilting retreat with my quilting friends from California, Oregon, and Washington. I am very excited to see old friends and to be able to just relax and work on projects. Or just goof off visiting with my friends and pretend to work on projects! Now it is decision time: what projects do I select to take to the retreat (whether I am planning to work on them or only pretend to work on them)? 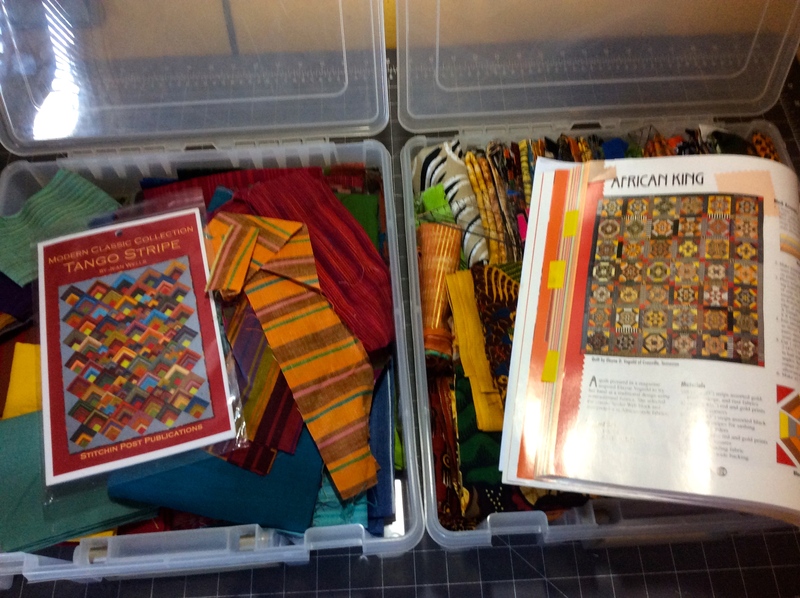 I usually bring TOO MANY PROJECTS to quilting retreats! In my mind I am going to be so productive and get a backlog of projects done. In reality I might get 1/2 to 1 project done. Projects to bring to quilting retreat? I think I am going to bring two projects pictured above – both are UFOs (quilters slang for “unfinished objects”). Next decision: do I cut the fabric according to the pattern ahead of time and do I start some preliminary piecing; or just wait until I get to the retreat? I have a couple days to figure this out. I also have a couple of days to psych myself up on how much stuff I will get done at the retreat. Yes I am being delusional and it is time to be honest: I will bring these two projects with me to the retreat under the guise of planning to be productive. I might even unpack them at the retreat and lay out the fabric and the pattern and mention my strategy to get my piecing done. Then I will set out to wander around and see what others are working on*, catch up on my quilting friends lives, and lounge around and read some crafting magazines. That is the proper way to attend a quilting retreat. Chuckle. I have a friend who, if she finishes one block, feels like she has been really productive. She is the one who keeps the fun flowing. Me, I do half and half. I bring more than I think I will finish (once I actually did finish all my projects, so I bring more), cut before the retreat, then don’t sweat what i don’t get done. I have been guilty of being like your friend but hopefully keeping the fun flowing. I think this time I am going to be more like you and cut ahead of time and try to do half of what I bring (maybe I should only bring 1 project, lol). Thanks for your comment!